I have a baby turtle, about 2 inches. i have him in a 70 gallon tank with proper lighting and everything. i have him several basking spots but he wont bask! All he does is swim all day and when he gets tired he'll just hang onto the basking are then swim again. I know hes strong enough to get on the basking area because I leave food for him there everyday and he eats it... then he goes back to swmming. 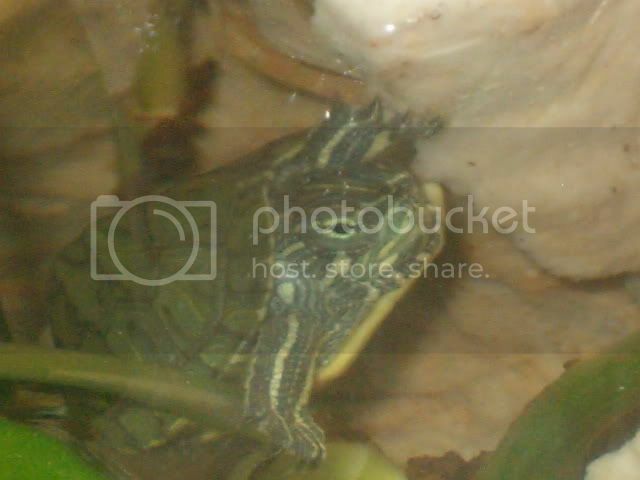 hes as cute as hell, but wont bask and im afraid his shell will get soft. i took him out of the container. he ran straight for the water. never knew turtles moved so fast. no wonder they beat the hare. NO! don't use a heated rock! Get a clamp lamp and a 75-100 watt light bulb (I use the infared heat lamps). Aim the light on the basking platform. Check the temp of the platform once it warms up. Adjust the light so the platform is 88 to 92 degrees. also make sure that it is easy for him to climb onto the platform. part of the platform should be submerged and at an incline or have steps. 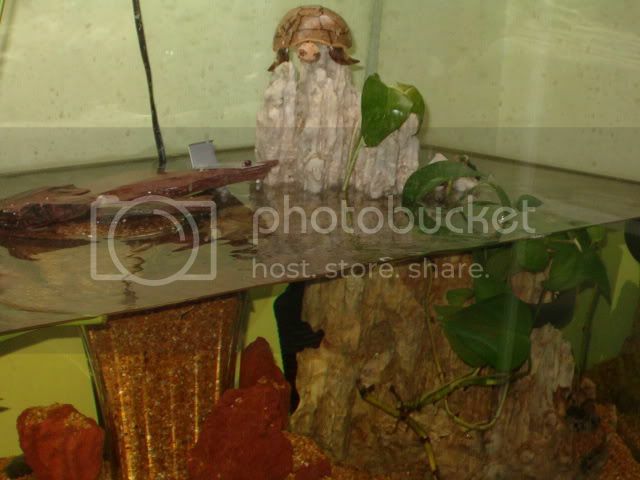 sweet setup, cute turt! yeah just get the basking spot at a good temp, and once he gets used to his surroundings he'll bask. in fact he may be basking when you're not around...who knows? speaking of shells getting soft, dont forget your turtle not only needs to bask, but the basking should also provide UVB light. Also, a calcium supplement, i.e. cuttlebone. Good luck! From the homegrowers soul, straight to his lungs. That's the method that I myself find fun. Start from seed and then you'll see, just how fun homegrowing can be. Those calcium "thingys" (a turtle or some kind of block) really don't give him the calcium he needs. Try small pieces of cuttlebone, or get a non-phosporus calcium supplement, moisten his pellets, coat them in the powder, let them dry and then feed them to him for added calcium. Electricity (i.e. heated rock) and water don't mix and could kill your turt (very cute, BTW). He should get the heat from above, as in nature (the sun). If there's no big difference between the water and basking area temps (8-10 degrees) he has no real reason to bask (for the warmth). You might want to add a plastic plant or two so he can rest on them as well as the edge of the basking area (it would also give him some privacy). Up to a year, the shells are more pliable, especially around the rear, so don't expect his shell to become rock hard. But some extra calcium for growing turts is good. Can he bask in privacy?